avid R. Cress worked for Parker's Technical Division for twenty years and was involved in many projects, some lead to finished pen models, some ideas were never put into production. He was involved in devising processes like injection molding, screen printing, sputtering, decorative hot stamping and powder coating. He also spent a couple of years in the product developement department working on a desk base, a gold nib designed by Devlin, which didn't make it into production, and was also involved in the developement of the Systemark, among many other things. e also holds a patent for Parker working with a Teflon-filled Delrin nib (an acetal homopolymer resin plastic). He worked as a quality engineer from 1981 until 1983 with the entire second floor of Arrow Park as his responsability and was eventually promoted to Quality Audit Manager for the entire plant. After leaving Parker he received 12 additional patents while working at Amerock. rom 1963 to 1983 I was a full time salaried employee of The Parker Pen Company, with most of that time being spent in the Technical Division. I also worked in the Technical Division the summers of 1961 and 1962, while obtaining my mechanical engineering degree. These are my recollections of working for a top notch organization, with great people and working on projects that were way ahead of their time, such as “computer related writing instruments”—long before the computer age, when computer programs were on punched cards. The Technical Division was divided into five main areas. he Research Department had the following Laboratories: Chemistry -- Physics, Plastics, Metallurgy, Ball Pen Ink Lab., and Basic Studies Laboratory. There was a Department Head (Ray Lawton most distinguished, who was there before 1950) and scientists, some with PhD’s, running the laboratories with numerous technicians doing the bulk of the experiments. he Technical Services Department consisted of the following: Library, In-Pen Test Section, Instrumentation, Materials Test Section and the Photo Laboratory. All standardized pen and ink testing, analyzing materials (infrared, UV, and x-ray) and support work was done here. Forrest Beck, who had done considerable ink development, was Department Head the longest. The figure eight write test machines, with twelve pens per side, were always running. he New Process Development Department took new, emerging technologies and advanced them to the point where production could use them to make writing instruments. Some of the technologies (which will be covered in more detail later) were plastic injection molding, plastic extrusion of writing tips, screen-printing, powdered metal fabrication, powdered plastic coating, and sputtering. Robert Burkhalter and Alton Schlegel were Department Heads. I worked in this department over thirteen years. he Product Engineering Department was the main area for designing and creating new and unique writing instruments. There was a Department Head (Frank Meinhardt most renown) and numerous engineers, technicians, and draftsmen. All engineering specifications were officially transferred to production (mostly by Larry Pierce). They had prolific, creative outside industrial designers who brought in elegant renderings. I worked in this department for almost five years. he Model Shop is were all the prototypes were made. Ronald “Snub” Freeman was the Model Shop supervisor the longest (from 1960 to 1979); followed by Carl Klawitter. Before Snub the supervisors were Bob Rudin, Sam Helgeson and Jerry Flynn. There were numerous machinists and jewelers, crafting the unique writing instruments with very fine detail. They made many slight variations of new designs and these would be shown to hundreds of people. This market research is what made the final versions so salable. 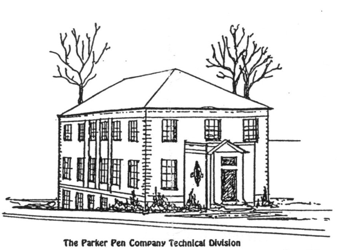 Parker Technical Division in 1978. David Cress is the guy in the beige shirt, glasses and moustache. In the front row in a black suite is Robert Fanella, who succeeded Fred Wittnebert as director in 1975.
ost people couldn’t even see the few thousands of an inch difference, but they would consistently pick one as the best looking. A lot of money was spent on this type of evaluating small aesthetic differences. They also produced many large 4x scale pen models. 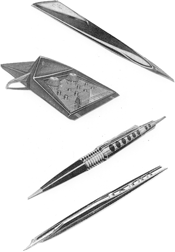 A large model of the Jotter ball pen was exhibited at the 1964 New York World Fair. hen I started at Parker in 1963 there were 73 people in the Technical Division, 26 were salaried and the rest hourly. By 1968 there were 59 employees and by 1970 the division was down to 53 employees. In 1975 the division was back to 58 employees. More than thirty of these employees were there this entire 18 years or longer. They were a close-knit group of people who still are friends to this day. Every summer all the families got together for a big potluck picnic and at Christmas the Technical Division had it’s own party, even though there was a big Parker office party for the non-union employees. This group of people, with spouses, still gets together every May, even though the number is starting to dwindle. It was the 21st “reunion” in 2006. Retirees came from as far away as Arkansas, Texas and California in one year. Six of the old timers from Janesville still get together every month. o get a salaried position in the division, as part of the interview process, a prospective employee would have to go to Chicago for a full day of psychological and intelligence tests. There were three tests: 1. Wonderlic Personnel Test, 2. SRA Non-Verbal Test, and 3. McMurry-Johnson Number Relations Test. To be hired, you had to get over 90% to 95% in two of the three tests ( I learned this later, when I retook the tests in 1966). In addition to intelligence, they hired an honest, trusting, stable bunch of individuals. Professional Development was encouraged. Chuck McDermott the psychologist from Chicago came every other month to lead workshops on improving individual’s skills. arker hired college engineering students to work during the summer on short term projects. This was beneficial to the student and company as it let them evaluate the individual for possible full time employment when they graduated. Many of the summer students eventually became long-term employees: including Joe Branks, Bob Douglas, Gerald Herold, Jerry Kelly, Alton Schlegel and myself. I was lucky enough to be hired two summers. In 1961 I worked as a technician helping Paul Johnson on a process to help prevent cracking in the Parker “61” collector shells. As I recall it was a cryogenic treatment. The plastic was “X-100” a proprietary plastic alloy of Plexiglas acrylic and Cycolac ABS. One somewhat boring task I did was put a tiny mark on the inside of two shells at a time with hot needles. This was done so returns could be identified, to determine if the process helped. In 1962 I had two engineering projects: devising a heat test to determine stress in molded plastic parts and a new molding process for “61” collector shells. 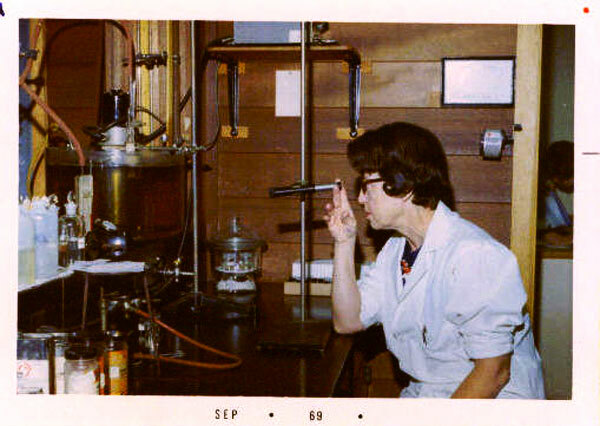 Chemical identification testing in 1969.
ne requirement of all projects done in the Technical Division was writing a comprehensive report at the end of the project (even summer students). These reports included photographs, graphs, bibliography and were usually 50 to 100 pages long. For the successful projects, these reports were used to transfer the technical details to manufacturing. Over 1 200 of these reports were written over the years the Division was in existence. I wrote 27 during my 20 years at Parker. Yes, they all had a heavy “Blue” cover. ll the procedures and required forms used in the Division were written down and in a “STANDARD PRACTICE INSTRUCTION” (SPI) booklet, one for each employee. Included in the procedures were practices such as Sample Numbering. Every incoming raw material or outgoing prototype had to have a number assigned to it. Each department and Laboratory had their own letter-number combination such as P-1234 for Product Engineering and D-1234 for New Process Development. Traceability was important. All testing procedures had a performance test specification number. The pocket test was an interesting one. A small cardboard drum held a cloth “pocket” with typical pocket or purse items, like keys and coins. A new plastic component or new plated finish would be tumbled for eight hours and then examined for wear (equivalent to a year in use.) A perspiration soak test was done using an artificial sweat that had urea, sodium chloride and lactic acid in it. Most pens and refills also had to withstand a “super cycle test”, a 100 cycles of alternating between a freezer and a 140° F (60° C). oven and still write. egal notebooks were used for all project work, to insure patent protection. All experiments, tests and procedures were written, signed and dated in the notebook every day. Periodically all the pages had to be witnessed by another engineer. All creative ideas, in addition to going into notebooks, had to be described on a formal “concept sheet”, another SPI procedure. Creativity and innovation was stressed and encouraged. We were allowed to spend 5% to 10% of our time on projects that we thought might have merit, without getting approval. I had an interest in games, so was allowed to make prototypes of three different game/toy ideas (“Triapath” board game, “Checkmaze” puzzle/game and magnetic road race.) Panoramic, a Parker Subsidiary, even made fancy prototype boxes for them. These were presented to the Company management in 1967. In trying to get the company interested in games, I discovered they had looked into it earlier. I found a Blue Cover Report entitled “An Investigation and Study of the Toy, Game and Hobby Industry as a Diversification Possibility for the Parker Pen Company” compiled by Anderson and Associates. After serious consideration, the Company said “no” to games, but in 1970, gave me the rights to the inventions. ost of the Research Laboratories were spread through the three floors of an older red brick building, shown on the cover, which was torn down about 1980. This building was attached to the downtown Janesville corporate offices that also housed the Model Shop, NPD and Product Engineering. 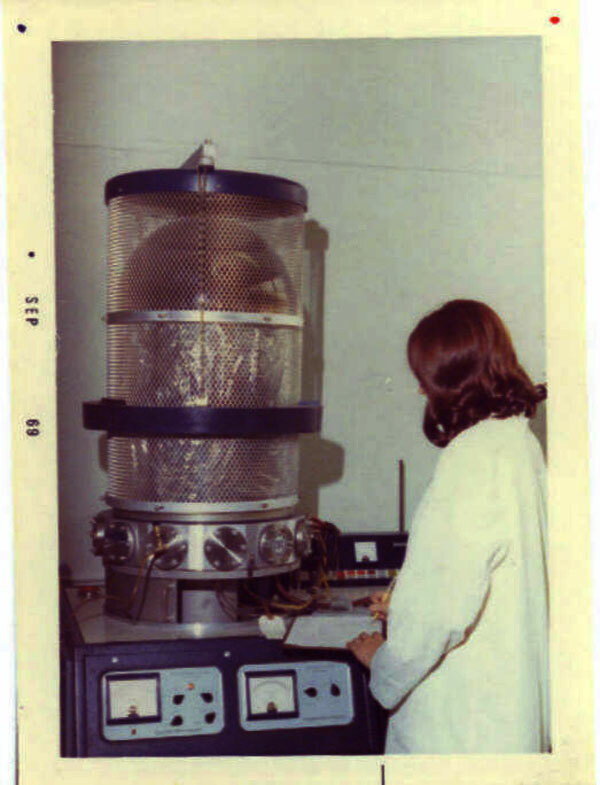 The laboratories always had the most up to date equipment. When I started they had mechanical calculators. About 1970 we got the first electronic calculators: Wang Laboratory networked calculators, about one foot in size — and they couldn’t even do square roots. George Tucker got one of the first computers with a hard drive. I remember it being about half the size of a desk and only had an 8k memory. 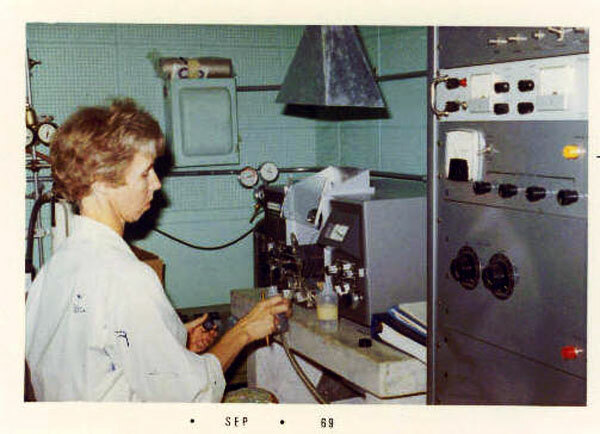 Parker's electrical test lab in 1969.
ur own photo lab turned out all the photographs for the blue cover reports until Xerox copy machines came out. Materials were tested in-house on infrared & UV visible spectrometry and x-ray diffraction. We did sputter coating and had our own mass spectrometer. When scanning electron microscopes came out, we used the technology extensively and eventually purchased one. In 1978 we even had a PhD physicist, Tom Chung, working solely to optimize the texture of the tungsten carbide roller pen balls. In the 50’s when the Jotter first came out, I believe the balls had diamond dust in them as an advertising gimmick. Before 1960 the Model Shop was in the basement of this red brick building. Everyone wore company lab coats, which were sent out to be washed every week. The Model Shop employees wore heavy work aprons with pockets for micrometers. ngineers and scientists were allowed to go to pertinent seminars, and all large technical shows in Chicago. Usually we went to at least one major national technical event each year. In 1968 I went to Las Vegas for an Association for Computing Machinery conference, to learn about computer recognition of handwriting. Gerald Herold and I went to New York City in 1978 to attend the WIMA meeting (Writing Instrument Manufacturing Association). In 1981 we had Sanford Research Institute work on a new “Liquid Lead”. I flew to California while working on that project. Bob Burkhalter flew to Germany to procure a dye. The Parker Technical Division was a great place to work. The Scanlon bonus plan and vacations were also excellent. ob Burkhalter remembers working on “secret writing” for the government, which now can be bought in toy spy pen kits. The special ball pen ink disappears when blown on with an acidic breath. Then when you want to see it, you take a basic substance like soap and rub over it to make it visible again. efore 1950, the engineers (David Chapman, Fred Perlin and Bill Hyzer) created a miniature camera (size around 1” x 2” x 3”) and about 100 prototypes were made (patent D160300). It took an eight exposure 16mm film cartridge. One reason it never went to market was that Kodak wouldn’t produce film for Parker. They also developed and tried to sell refillable butane lighters. Making synthetic marble bathroom counter tops was explored, as well as making fiber reinforced fishing poles. These are just a few more examples of the Technical Division working on items way ahead of their time. aniel Parker strongly encouraged “Research and Development” and gave a talk at the University of Wisconsin on R & D in October 1963. He and Kenneth Parker were the main ones that got us involved in some of these unusual projects. Daniel Parker became head of the Federal USAID (United States Agency for International Development). Snub Freeman was involved in the making of a large silver desk base for Dwight D. Eisenhower. It was about 18” by 10” and held two “51” pens, that had special ground nibs; one right-handed and one left-handed. Mounted on the silver plate were 24 small stones from the places Dwight had lived. It has the initials ”DDE” and five stars. They prematurely had the White House engraved on it before he was president, and had to meticulously remove it, only later to add it back. ne of the stories I remember was that uneducated pregnant women in Africa or Asia would drink Parker fountain pen ink so that their children would be literate. This is definitely not recommended, but Parker inks were all tested and were not toxic. Independent test laboratories used a “rat” test. Large quantities of ink was force fed to a number of rats; if any would die, that formula was not used. thought Fred was an excellent leader, who had me in his office numerous times. Being the youngest engineer, he told me I was on his “counsel of youngsters”. In 1974 I started growing a mustache; Fred pulled me aside and said “He wouldn’t hire someone with facial hair.” Fred’s memos were always very long and extremely detailed. He kept a journal on all the books he read. He would sometime write a multi page synopsis of each one, almost a book in itself. I developed a similar habit, but kept the notes much briefer. Even after retirement Fred continued to do work for the government, taking weekly trips to Washington D.C. Fred was born in Bayonne, New Jersey on July 8, 1911 and died on December 30, 1996 in Janesville, Wisconsin. A write-test-machine testing the nib of a couple of Parker 45's, 1969.
roduct Engineer Homer Ted Green was a key engineer in the Division. He designed and developed the “45” fountain pen and the titanium T-1 fountain pen. He received eleven significant patents while at Parker. #D188637 & #D195385 for the “45” and #D223130, #3606556 & #D220633 for the “T-1”. One was for a pencil eraser holder (#3544227). The metal refillable ink cartridge was also one of his patents (#D196993). Some of his other projects were: “School Pen”(100’s of prototypes made), 19 cent Eversharp Ball Pen, “51” successor fountain pen, $1 throwaway-capsule plastic nib fountain pen, Duofold Touché, “POP” line fountain pen, window Jotter, “61” convertible fountain pen and he even had a project to work on watch band design. Ted died of cancer not too long after the T-1 pen got into production. rank Meinhardt was one of the developers of the Jotter T ball pen with the textured ball. He was at Parker over 30 years and was head of Product Engineering for over 15 years. He received two patents while at Parker. The T ball patent was #3303825 (co-inventor Robert Schuman). With a microscope Frank enlarged the textured ball surface; counted the grains and determined the percent of porosity. Frank also worked on the Liquid lead pencil and helped with many of the fountain pen designs. He was a perfectionist. I remember him telling me about sifting the dirt in his front lawn to remove the stones. His last position was Director of Special Studies. he first ball pen refills were made with bronze seats and stainless steel balls. Jerry Goodman was testing the refills when the first tungsten carbide balls were developed. The balls would wear into the seat too quickly and only wrote out about 10% of the ink. Jerry came up with the idea of using stainless steel seats. He had hundreds of these made and tested. They lasted 10 times longer and eventually went into production. Jerry worked in research about three years, 1960 to 1963, then went to data processing, working for Parker Pen over 30 years. He helped do some of the calculations for fluid flow (leaks) on the government contract for missiles. (Jerry visited with me February 2011— he is 85 years old). In 1958 Walter Bieger designed a number of futuristic “Dream pens”. The Colormatic, which at the press of a button changes ink color. arker had two outside industrial designers, Nolan Rhoades and Don Doman, who did a significant amount of the aesthetic design for writing instruments and desk bases. They would bring in a portfolio of sketches for a particular project and Parker personnel would pick and develop the one or ones they though were the best. Many times, numerous models were made and shown to 100’s of people before the best was selected. Nolan Rhoades received 16 patents assigned to Parker. Nolan designed the first Jotter with ribbed barrel (patent # 3205863) and the Jotter Ball Pen mechanism, which rotates the refill every time you propel and retract it, (patent #3205863). Don Doman received 12 Parker patents, mostly for desk bases, as well as the “Clip-It” paper cutter (patent D197227 and D197228). The first “hooded nib” pen, the ‘’51” was designed by another outside designer from Milwaukee, Brooks Stevens, who had designed the Studebaker car. obert L. Kuranz started in 1956 and spent 33 years at Parker. He was the ink specialist and worked on all ball pen and fountain pen inks as well as the ball pen grease follower, Touché refill, and improvement studies. He received one patent while at Parker. Jerry Kelly and Robert did extensive thin layer chromatography studies on all brands of fountain pen ink. These were used to aide in determining dates of written documents. After leaving Parker, Bob worked for various lawyers authenticating written documents and helping to uncover forgeries. Bob’s most famous case was proving a “Jack the Ripper” Diary as a fake. The forger was smart enough to get ink from a Company that makes old formulations, but it had a mold inhibitor in it that wasn’t in ink in 1889. Bob Kuranz was also on the Parker Community Credit Union Board for 26 years. Jerry Kelly left Parker and used his ink expertise at the Wisconsin State Crime Laboratory. roduct Engineer E. Dale Thompson came from the Shaffer Pen Company in 1970 and worked on the Tiffany Classic, high quality slim line, anodized aluminum, Queen Elizabeth pen, new Coronet and desk bases. He received two patents while at Parker. All new engineers in product engineering got to work on desk bases — it was one of my first projects when I transferred into Product Engineering. patents while at Parker. Martin is currently on the Parker community Credit Union board. erry Flynn a 38 year employee of the Parker Pen Company worked in many Divisions. He started in the experimental group at Gilman and when bought out by Parker in1956, he came to the Model Shop. After heading up the Model Shop, he was in charge of the Special Products Division, then Trent Engineering and eventually into management at Arrow Park. oe Branks was a mechanical engineering summer student in 1955 and went into the military before he came back to Parker full time. One of Joe’s unusual projects about 1960 was developing a more efficient outboard motor propeller with a round sleeve or duct around it. He and Ken Kelsh got paid to spend a big part of two summers boating on the Rock River. They did drag tests of various materials and different aerodynamic shapes by pulling them behind the boat. At the time Parker Pen also owned two small boat companies in Florida that made 22/24 foot long “Gulf Boats”. They also worked on the first jet drive for a boat, a noisy 7 ½ hp Garelli single piston motor. Joe moved into product engineering in the early 70’s and was one of the developers of the universal refill, which was called Systemark when first introduced and now called Vector Roller Ball. The first injection molds for the plastic collectors was made from stacked shim stock, as thin as .005 inch, not much thicker than a piece of paper. Parker’s patent is #3951555, with inventors listed as: Fred Wittnebert, Frank Meinhardt, Joe Branks, Gerald Herold and Dan Stambaugh. 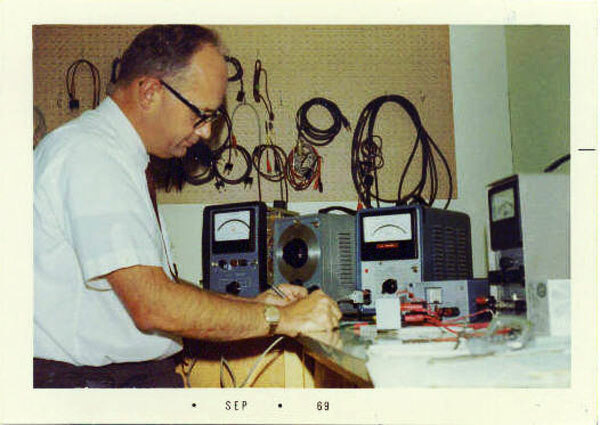 erald Herold was a summer student in 1961 and started in the New Process Development Department in 1964. In his 22 years at Parker he received four patents, all while in Product Engineering. Gerald “represented the Technical Division on the Phoenix Committee which consisted of all Divisions of the Company. Bill Swanson as President of The Parker Pen Company charged the Phoenix Committee with coming up with new writing instrument concepts.” Gerald was also on the Parker Community Credit Union Board for 15 years. After leaving Parker he worker at Amerock and then went to A.T. Cross. obert Burkhalter started at Parker in 1952 before the summer student program began. Bob graduated first in his engineering class from the University of Wisconsin. Bob and Art Perry started one of the first plastic injection molding laboratories in the country and wrote papers for the Society of Plastic Engineers ANTEC journal. 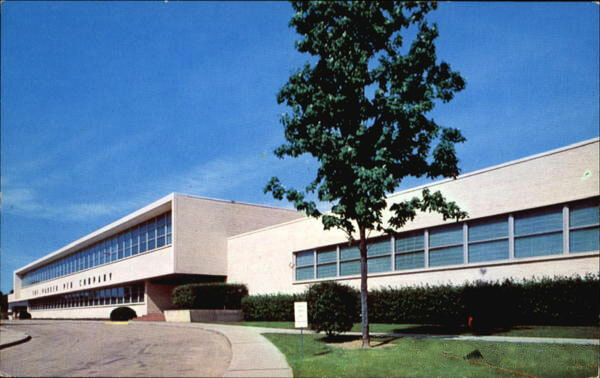 This “Joint Molding” laboratory at Arrow Park, was first run by Willy Techesen and Walt Georgie. I started work there in 1963, where we studied molding and design parameters to improve and make stronger plastic components. Screw injection molding came along about 1964, and Parker bought the second one made in the country and used it to make significantly improved components over the older plunger molding machines. obert Burkhalter told me that “The first Japanese roller balls didn’t work because they used a dye with salt in it. They tried to copy our ink, but since salt doesn’t show up in an infrared spectrometer test, it took them a while to figure that out.” Robert went to Sanford after leaving Parker in 1980 and was in charge of their engineering group. I joined him there in 1983. Alton Schlegel started at Parker in 1957 as a summer student in the plastics laboratory and then started full time in the Metallurgy Laboratory in January 1958. He eventually became Director of the Corporate Technical Center. Robert Burkhalter and Alton Schlegel both advanced to become head of the New Process Development Department. Each was my boss for over 6 years. Some of the projects I worked on under their direction are listed below. n the late 60’s I designed a molded plastic nib with slots to feed the ink. I molded various combinations of plastic and many different fillers, and worked on this for over two years, to get the right feel and wear resistance. Delrin plus Teflon was the smoothest, but the slots tended to clog up with heavy pressure writers. it came very close to going into production. Over 100 “45” pens were made with these tips and put on a field test. For writers using heavy pressure, they wore out too fast. This was also about the time fiber wick tips came into being and they got the nod to go into the Touché pens. The large field test was done with a Teflon filled nylon, but it didn't feel quite as smooth. I also worked on a more conventional looking plastic nib with a slit, that we sputter coated with ruthenium to provide wear resistance. As I recall it passed the wear/writting test. At least I got my one Parker patent on this nib (# 3,507,600). alking about patents I should digress and mention we had an on site, full time patent attorney, John Fabke. John was an attorney who went back to engineering school after ten years of practicing law. He was in some engineering classes with me and after he got his degree, came to Parker also. Parker policy was to keep all processing information secret rather than trying to patent it. John was the keeper of all this confidential information. Snub Freeman remembers John “as a big eater and when on a diet, would come into the Model Shop every other week and punch more holes in his belt.” John got melanoma and died in 1982.
putter coating is a vacuum process to apply very precise, durable coatings. It is mainly used in the electronic industry to make computer chips. About 1969 Parker bought two units and Gerald Herold and I did extensive development work. This process was eventually put in production to replace gold metal electroplating after I left Parker. Much thinner and more wear resistant coatings can be applied with this process. I developed a thin iridescent, wear resistant, glass coating, which never made it to production. We even worked on applying ruthenium coatings to plastic nibs with some success. The Division encouraged additional schooling and allowed individuals to take classes during work time. I took one class at a time and eventually got my MSME in 1971. My master’s thesis was on injection molding of thin plastic components. Since the company was interested in this research, I was also allowed to do the experiments on their molding machine. This is another instance of the Technical Division being a great place to work. and two decorative Hot Stamped Prototype "Big Red". owder plastic coatings were invented about 1972. We bought one of the first “spray guns” and did extensive development of clear and colored coatings. After curing these epoxy coatings in an oven they became very durable. Much of the outdoor furniture has this type coating now days. 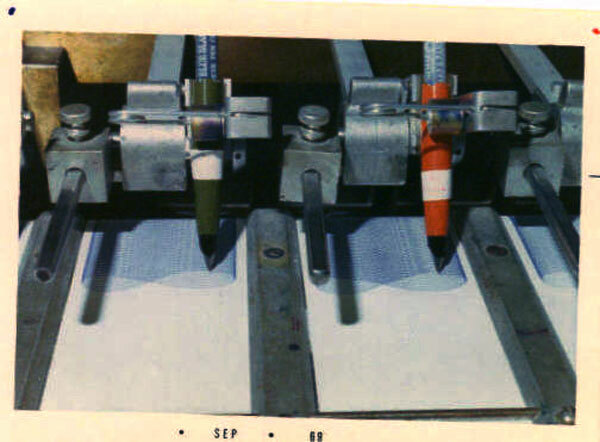 In 1975 I worked on machinery to apply interesting four color patterns to pens using a screen printing process. We developed a process to make very durable screens, which were used in production to print the “Big Red, White, and Blue” Bicentennial flags on “Big Red” ball pens. While in Product Engineering I designed an adjustable flow nib, which changed the written line width by rotating a collar around the nib. It didn’t make it into production as the “180” was developed after this and was much simpler to produce. I even worked on a futuristic “Ultra Pen” and on a gold nib designed by Stuart Devlin. Another process was applying patterns with a preprinted transfer to get a Denim appearance (never went into Production). he Division had many intelligent laboratory technicians with four year college degrees. Some were very dedicated and spent over twenty years there. These technicians did most of the experimental, time-consuming, repetitive work and all the “gopher” work. They didn’t always get credit for all their extraordinary effort. Some were very creative. I hired Geraldine Lucash because of her “Mechanical Aptitude”. While interviewing, she told of having her bicycle torn apart and laying all over her living room. rank Hill started in 1960 and spent most of his 22 years in the metallurgical laboratory. He received two patents while at Parker. Frank replaced John Anderson, who along with Frank Hayes from Gilman, started a powder metal company to make porous metal components using the technology that was learned in making the first porous stainless steel ball pen balls. This company was Sintered Specialties, which was owned by Parker. After being sold, it became SSI Technologies and now has over 1000 employees. ob Douglas got one significant patent, on ball pen grease followers (# 3458266), which is sighted in later ball pen patents. Bob left Research after seven years to go to Gilman (a machine tool company Parker had owned) and worked his way to the top spot as General Manager. Bob went on to be president of Engineering Systems Division of Litton Industries and Advanced Assembly Automation Inc. He’s a good example of the very capable people that were in the Technical Division. 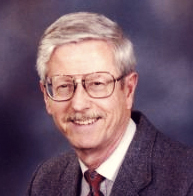 Dr. Thomas Hall, a PhD physicist, started in 1978 and contributed to a comprehensive analysis of nib smoothness/scratchiness and leak detection of roller ball pens. After leaving, he became Quality Assurance Manager at Amerock. John Dyson was a very creative chemist who was involved in many early products. John received nine patents, the most notable being the Teflon coating on the “61” pen to prevent ink from sticking, or “shedding” from the surface when dipped in ink (#3030925). He recommended Exxon stock to me before he retired—excellent advice. few of the other long term, significant people from the Research area need to be mentioned. The first technical person hired by Kenneth Parker was Galen Sayler, Chief Chemist (who received 6 patents). Chet Holloway was head of the Technical area before Fred Wittnebert and left to be General manager of Gilman. Before Chet, Harlan Zotner was in charge of Research. Raymond Spaulding (who received 2 patents) was head of Product Engineering before Frank Meinhardt; and before Raymond was Wilson Green. Ray Lawton, an expert on capillary theory and fountain pen collectors was there over 30 years and received five patents. Forest Beck was also there over 30 years and received one patent. He developed many inks and laboratory tests; eventually becoming manager of Quality Assurance. fter Fred Wittnebert’s retirement in 1975, the next director/VP was Robert Fanella, a mechanical engineer, who had been at Argon Labs, Sunbeam, Ampex and Borg Warner. 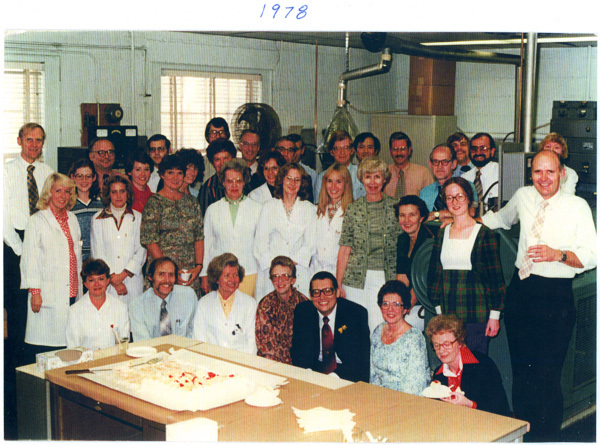 In 1978 Robert reorganized the division into two groups: “Product Development” and “Research & Corporate Quality”. A number of “outsiders” were brought into the new “Technical Operating Division”. The Quality Assurance group got us closer to Manufacturing and the “real world”. Prior to Robert’s arrival, we were in the proverbial “Ivory Tower”—separated from manufacturing, both in distance and philosophy. n 1979 Jean Deleplanque, (who had been Manufacturing Manager at Parker France, European Area Technical Advisor and Director of Parker Germany) followed Robert Fanella as Vice President of Technical Operations. Jean instituted weekly noon luncheons, where the engineers and scientists took turns presenting talks on various technical topics. Some were: Ink Jet Printing, Shape-Memory Alloys, Liquid Chromatography, Creativity, Scanning Electron Microscopy, Micro Encapsulation, and Lasers. When they remodeled the downtown corporate headquarters building, Jean moved the people to the building behind the manufacturing facility at Arrow Park, which used to be the cafeteria. In August of 1980 after only about a year he was forced to resign (had 16 years with Parker). Also over one-half of the remaining Technical Division employees had their positions eliminated; twenty-three people down to eleven. Those remaining were placed in the new “Corporate Technical Center” or other positions at Arrow Park. It was pretty much the end of an era of the intellectual, creative dynasty that was built by Fred Wittnebert. want to thank all the people who gave me information and helped with this “story”. FORREST BECK Ball Pen Ink Lab. JOHN DYSON* Basic Studies Lab.